Preview images for the NCIS: Los Angeles episode titled "Black Market"
After a Homeland Security agent is poisoned by a notorious Triad assassin, NCIS uncovers a warehouse of counterfeit purses and a money trail to stolen government funds. Also, Nell joins the team in the field, on NCIS: LOS ANGELES, Sunday, Oct. 16 (8:00-9:00 PM, ET/PT), on the CBS Television Network. 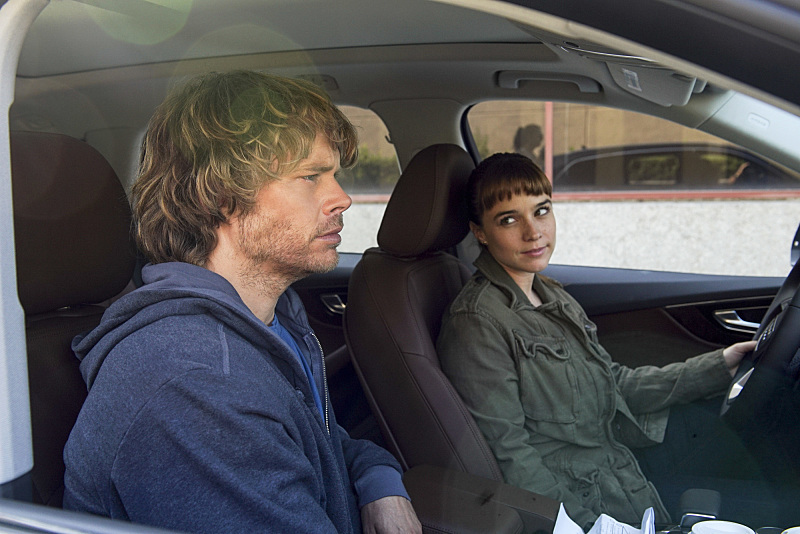 "Black Market" -- Pictured: Eric Christian Olsen (LAPD Liaison Marty Deeks) and RenÃÂ©e Felice Smith (Intelligence Analyst Nell Jones). After a Homeland Security agent is poisoned by a notorious Triad assassin, NCIS uncovers a warehouse of counterfeit purses and a money trail to stolen government funds. Also, Nell joins the team in the field, on NCIS: LOS ANGELES, Sunday, Oct. 16 (8:00-9:00 PM, ET/PT), on the CBS Television Network. Photo: Ron P. Jaffe/CBS ÃÂ©2016 CBS Broadcasting, Inc. All Rights Reserved. NCIS: Los Angeles stars Chris O’Donnell (Special Agent G. Callen), LL COOL J (Special Agent Sam Hanna), Linda Hunt (Henrietta “Hetty” Lange), Daniela Ruah (Special Agent Kensi Blye), Eric Christian Olsen (LAPD Detective Marty Deeks), Barrett Foa (Tech Operator Eric Beale), Renée Felice Smith (Intelligence Analyst Nell Jones), and Miguel Ferrer (Assistant Director Owen Granger). Daniel Blake (Male Nurse), and Denell Johnson (Barista).